Designed by BPC Architecture, this property truly embraces the spirit of the summer. The main house has three finished levels of living space, outfitted with five bedrooms and five+ bathrooms. The cabana is the perfect setting for endless lazy afternoons or additional entertaining space for summer fêtes while dining al fresco around the 16'x32' pool. Highlights of the property include multiple porches and patios, a fire pit and the potential for excellent summer rental income. While the 2019 season is tenant-free, ensuring immediate summer enjoyment for the new owners, the property has rented for $25,000 per week in previous seasons. From the covered front porch, one enters into the gracious foyer; to the right is a den with eight large windows flooding the space with light. The heart of the home is the Great Room, accented with architectural details including columns and coffered ceilings throughout the house. The focal point of the living room is a gas fireplace flanked by window seats and a recessed TV above, and French doors leading out to the back porch and patio beyond. The kitchen is ideally laid out, with several workstations, two sinks, high-end appliances, a pot filler above the stove, marble counters, two recycling stations and a center island with a polished wood surface and counter seating for three. The master suite is sited at the back of the home, overlooking the gardens and pool area; a hallway leads to the walk-in closet with built-in storage, and a bathroom with a glass shower, two sinks with recessed medicine cabinets above and marble throughout. The bedroom has a cathedral ceiling and French doors leading out onto the patio. A laundry room with two sets of washers and dryers, mud room and powder room complete the first floor. The second floor is home to three suites; the first suite is accented with vertical shiplap, high ceilings and a dressing room which leads to a bathroom with a shower. The second suite features a horizontal shiplap, high ceilings and a very spacious bathroom with a large glass shower, separate claw foot tub and a vanity with two sinks. The third suite is accented with beadboard and has a bathroom with a marble sink and a tub/shower. The lower level offers over 1,100 square feet of additional living space, ideal for game night, rainy days and extra guest quarters. In addition to the high ceilings, the finishes are of the same quality as the rest of the property, making the space enjoyable and versatile. A large family room accommodates the TV area, game area, and a wet bar; the bar includes an EdgeStar ice maker, SubZero refrigerator as well as a bar sink and plenty of cabinetry for storing entertaining supplies. Beyond is a bathroom with a glass and tile shower, as well as a bedroom. A finished room ideal for a gym or home office and a separate mechanical room complete the lower level. The cabana anchors the back of the property and makes for the ideal entertaining area; its doors swing wide to let the outdoors in and offer a covered area for dining even in inclement weather. The core of the cabana includes both living space and a kitchenette area, idea for preparing lunches and cocktails poolside. Beyond is a bathroom with a shower and a finished room for whatever suits the needs of the owners. An outdoor shower is found on the side of the cabana, and a path leads to the Madaket Road bike path either pointing to the west end of the island or a short distance to Town. Originally from Pennsylvania, Laura grew up in Vermont, and was first introduced to Nantucket during her college summers where she worked in many hospitality fields. Upon graduating from the University of Vermont, Laura moved to Nantucket permanently after accepting a science teaching position at the Nantucket New School. From there, she moved onto the historic Jared Coffin House, working as their Director of Sales. 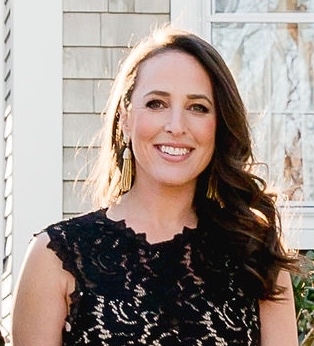 She is an executive board member of Palliative and Supportive Care of Nantucket and has co-chaired their annual Gala since 2013, and also sits on the Nantucket Boys and Girls Club Summer Groove committee. Some of her favorite island activities include yoga, exploring the extensive network of conservation land trails and stand-up paddle boarding in Nantucket Harbor. Laura has been with Great Point Properties since 2004 as a sales and rental broker and offers years of experience from her time in the hospitality industry with a keen eye for attention to detail.